Waterfalls in Kerala are numerous. As one travel to the dstinations in Kerala, one can pass through narrow waterfalls and bewitching waterfalls. Spend time here and get the refreshing and cool atmosphere to revitlise yourself. The important waterfalls in Kerala are Athirapally, Vazhachal, Palaruvi & Tusharagiri. The scenic beauty of Vazhachal (63 km from Thrissur) catches your attention the moment you enter the area dominated by the Sholayar ranges. Falling from a height of 80 feet, the Vazhachal waterfall presents an awe inspiring scene for tourists to view and enjoy. Athirappally fall is 5 km away from the Vazhachal waterfall merges with the water of the Chalakudy river after falling from atop. Both these waterfalls with their pure and clean water are completely mesmerizing for visitors. Thomankuttu is well known for its beautiful waterfalls. 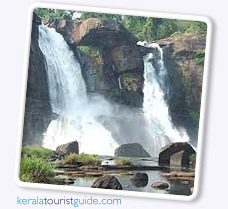 Lying at a distance of 74 km from Cochin, the seven step Thomankuttu waterfalls is splendid in its beauty and charm. Each step provides a cascade and a pool beneath. Numerous caves surround the waterfall which has emerged as a hotspot for tourists wishing to chill out. While on your way to view the magnificent wildlife of the Periyar Sanctuary from Munnar, stop by to view the Powerhouse Waterfall.They are a visual treat for eyes. Falling from a great height of 2000 m, the fall takes its spectator by surprise due its beauty. Western Mountain ranges surrounding it add to its beauty. Another ideal picnic spot for the tourists, the Aruvikkuzhi Waterfalls falls from a height of 100 feet. The highlight of this waterfall are numerous streams that make their way through the landscape occupied with rubber plantation. is a 800 foot high waterfalls at the entrance of the Sholayar ranges and is a famous picnic spot for backpackers. The forests of Western ghats are punctuated with large and small waterfalls that gurgle and splash down the mountain side. The wooded forests forests of Western ghats are hidden with cascading showers.